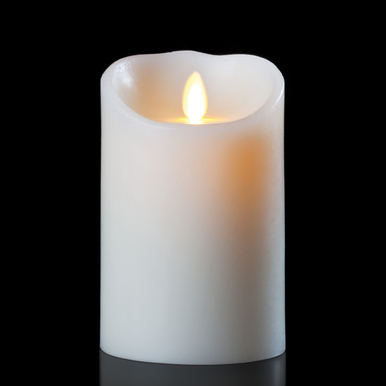 Remote Ready, Luminara 3.5 by 5 inch IVORY flameless candle. Five hour timer feature turns the candle on at the same time every day. The candle also has a built-in receiver for the optional remote control. 3 position switch on the bottom of the candle: Off - On - Timer. In the full On position the remote control is active. Remote is sold separately. Luminara candles from GKI bethlehem. This candle is made of real wax, use indoors or outside for an event in shady area only. We also carry plastic candles for use outside. Inspired by technology developed for commercial and entertainment applications, Luminara Candles are the most realistic flameless candles on the market today. The secret is a patented system of LED’s and electromagnetics. In each Luminara Candle, an internal LED shines upward through two opposing magnets, making the light move back and forth as it reaches the flameless wick. The result is a flameless light that dances and flickers before your eyes, a flame effect that looks just like a real candle.